Robert Schumann wrote his piano quintet in September and October 1842, in his ‘Chamber Music Year, in which, after an intensive study of classical works, he also wrote three string quartets, a piano trio, and a piano quartet in addition to this popular quintet. Completed in a matter of weeks and dedicated to his wife Clara, the Piano Quintet virtually invents a brand new musical genre by adding the new piano to the established quartet. Later composers over the next 100 years would be inspired by this work, but only three of their works approach the enduring popularity of Schumann’s piano quintet: Brahms, Dvořák, and Shostakovich. The quintet was first performed on December 6 1842 in a private home, with Felix Mendelssohn at the piano, then publicly on January 8 1843 at the Leipzig Gewandhaus with Clara Schumann at the piano. After hearing it, Schumann pronounced the quintet ‘his best work’. The opening Allegro brillante commences with a bold and sparkling musical idea, gradually unfolding and expanding. Almost immediately however, a soft and tender dialogue between the viola and the ‘cello contrasts it. In due course, both themes are extensively fragmented and subjected to far-reaching modulations. The opening theme of this first movement will reappear much later in different movements; in the fourth movement as a centrepiece of the fugue ending the work. The second movement In modo d’una marcia exudes the ambiance of a funeral march. A dark and mysterious melody is introduced by the first violin and haltingly accompanied by sobbing musical rhythms. The contrasting musical idea presents a welcome relief from this morose atmosphere, yet the movement is once more rounded off by the return of the ungodly march. A simple, unadorned moment concludes this movement, which seems to be almost a war between the happy and the sad – a true reflection of Schumann’s own personal battle between his opposing personalities. The Scherzo joyously and exuberantly presents ascending and descending major scales, skilfully contrasted by two Trios, respectively sounding a lyrical canon and Hungarian gypsy music. The finale, marked Allegro ma non troppo, presents an opening descending theme in C minor and a second ascending theme in E flat major. After elaborating both themes, Schumann combines the first with the theme of the first movement, in a brilliant double fugue introducing new counter-melodies – an homage to the contrapuntal style of Bach, whose music Schumann revered and studied throughout his life, finishing with the sound of a rousing country dance. Brahms’s piano quintet is one of the few standard repertoire works which went through two radical revisions of format by its composer until he was finally satisfied with it. Its first incarnation was as a string quintet first performed in 1862, but Brahms destroyed the manuscript after a virtuoso violinist friend advised that strings alone could not carry the weight of the music and suggested revising it for piano. Brahms then turned it into a sonata for two pianos, but Robert Schumann’s widow Clara joined other critics in suggesting that pianos alone could not express the sustained passionate intensity required, and that string voices were essential to the work. Its final transformation into a quintet for piano and four strings was finished in autumn 1864, premiered in 1866. The first movement is predominantly sombre and tragic. It opens with an eerie unison of piano, violin, and ‘cello, soon reiterated by the entire quintet in a powerful and painful way that represents the ‘Sturm und Drang’ frequently employed by Brahms in his dramatic compositions. The whole movement is derived entirely from this first theme. Brahms’s gift for thematic variation and his skill with rhythmic complexity – particularly his use of two beats against three which makes for a driving pulse with a myriad of cross-rhythms – provide a broad and powerful scope to the movement and sets the tone for the work as a whole. The full contrapuntal resources of the string quartet are combined with a rich variety of piano techniques to create a density of texture. The second movement is written with Schubertian lyricism, expressed through the calm grace of the piano, accompanied by the gentle swaying of the strings – a prevailing tenderness occasionally revealing a hidden sadness. Towards the end the quartet takes the opening song of the piano, and reveals it in a quieter, more reflective mood. This movement forms a sweet intermezzo between the contrapuntal complexity of the first movement and the temperamental quality of the third. The Scherzo is one of Brahms’ most electrifying compositions. It contains three motivic elements: a rising theme of vague rhythmic identity; a snapping motive in strict, dotted rhythm; and a march-like strain in full chordal harmony. These three components are juxtaposed throughout the movement, with the dotted-rhythm theme being given special prominence in a vigorous fugal exposition. The middle section transforms the march into a majestic and powerful chorale. After this Trio section, the movement then returns to the maniacal opening themes, and closes in an aggressive and decisive manner. The finale has a structural composition unique to Brahms. It opens with a haunting introduction that becomes more dramatic until the tension is released with the Allegro non troppo section. Here the ‘cello plays the first theme – a folk-like melody developing into a gypsy dance. Brahms interweaves several themes throughout this movement: the folk-like melody, the rustic dance, and a meditative refrain. His genius in writing variations is exquisitely demonstrated in this movement by the way he morphs and blends the themes together, culminating in a breathtaking coda sweeping the work to a dramatic end. Lucia Veintimilla,born in La Mancha, Spain, started playing the violin at the age of four and finished her degree at the High Conservatory of Asturias with First Class Honours. She also combined these studies with her bachelor degree at the Guildhall School of Music and Drama, where she has just completed her Artists Masters in Performance. 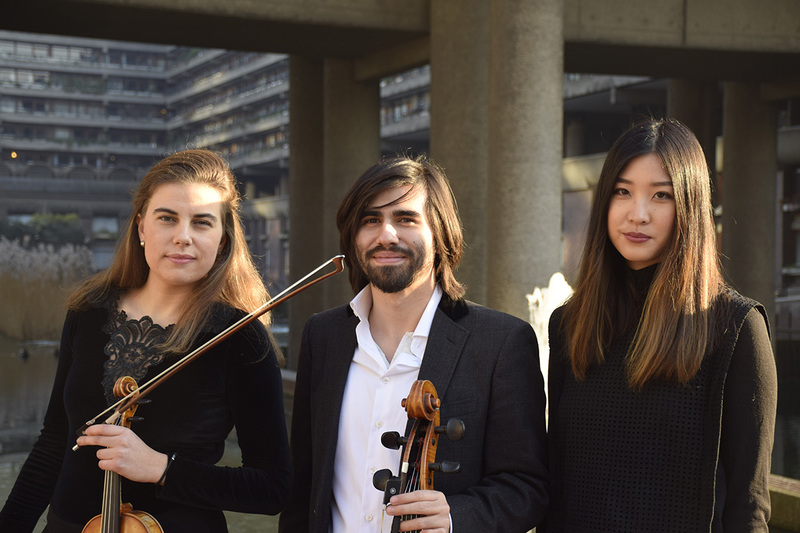 A passionate chamber musician, Lucia enjoys a busy career performing regularly with The Armorel Trio, the Deco Ensemble and the Astedt-Veintimilla Duo, touring extensively to major concert halls in UK, Europe and Asia. Lucia plays a violin built in 2014 by the renowned Spanish luthier, Roberto Jardón Rico. When aged 12, Sebastian won a place and bursary to study at the Yehudi Menuhin School Cobham under Thomas Carrol, Charles Watt and Marie Macleod. Sebastian has performed across Europe, including France, Germany, Spain, Italy and Poland, with television and radio appearances in Switzerland, as well as at all the major London’s venues. Timothy plays a Venetian violin from around 1700, maker unknown. Kate de Campo sis currently in her third year at the Guildhall School of Music and Drama where she is studying with Matthew Jones. Previously she attended the Junior Royal Northern College of Music, where she was awarded the Vicci Wardman prize for viola three years running, as well as the Chamber Music Award in 2015. Kate enjoys her current work at Pro Corda, an organisation which trains young musicians in chamber music and which had a great impact on her musical education. Kate’s viola was made by the Manchester-based luthier Helen Mitchchetschlager in 1986.